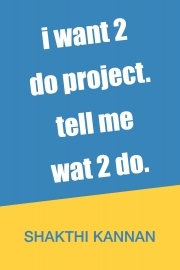 Description of "i want 2 do project. tell me wat 2 do." The book has been written to help students and professionals as well to work on free and open source software (F/OSS) projects. These software projects are released under a freely distributable license which allow you to use, copy, make changes, and distribute the software. This is different from proprietary software, where you only receive an executable under a restrictive license, and the source code is not provided to you. The book teaches you the methodology to be followed when working with F/OSS projects and similar programs. This will help you to become a valuable contributor to these projects, and get wide recognition as an individual. Shakthi Kannan is a Free Software enthusiast who blogs at shakthimaan.com. He can be reached at author@shakthimaan.com. He has been advocating the use of F/OSS across India. His online presence is by the name @shakthimaan. Reviews of "i want 2 do project. tell me wat 2 do." community. Contents in every chapter is so simplified and easy to understand , the only thing required is consistency and dedication. I have learned about a lot things and terminologies after reading the book. This book has helped me a lot and will continue to do so. Thanks Shakthi Kannan for such a great book. I was lucky enough to do my bachelor's in Engineering in Pune around the time that Shakthi Kannan was still here. I attended quite a few lectures and workshops conducted by him: testing with Cucumber, Git in Emacs using magit and so on. When I found out that he had written a book for students looking to do projects, I ordered one right away. I wish I was a few years younger as I could have benefited immensely had I received one during my freshman year. Unfortunately I had to learn a lot of the things mentioned in the book the hard way. The premise of this book is simple : it's a guide for a programmer to participate in a FOSS project. It has everything from asking the reader not 2 typ lik dis wen talkin to other people on the Internet to creating a presentation for your project. It's divided into 10 chapters, and each chapter has around 15-20 subsections. The way I suggest one to read the book is in two iterations : in the first just read it to understand the contents. After that, use it like a dictionary or thesaurus. If you are about to send an email to a mentor, read it. If you are going to send a patch upstream, read the relevant bits. If you are done with your project and need to present it, read it. One of the important things that this book does is introduce terminologies related to open source projects. Although this is not done very intentionally, which is apparent by the missing glossary. For example, one of the first things that a newbie to FOSS will come across is mailing lists. Or what does the word 'triage' mean ? All these generic things, which are independent of the domain of the FOSS project, are explained for the benefit of the user. As a former Google Summer of Code student (and now a mentor), I've had the pleasure of interacting with quite a few students. I sometimes conduct workshops or meetups about embedded systems too. Every time I interact with students and professionals, in person or virtually, I feel that Shakthi's book should be made mandatory reading on the first day of your college or job. It was February 2nd 2013 when I first time attended the Shakthi 's presentation “I want to do Project tell me What to do” at SITRC Nashik in a Fedora Workshop. I was motivated and re-energize to throw myself in the beautiful Open-Source World. A average student from average Engineering College of University of Pune where Environment and the background of college and city doesn't shows Open-Source Culture. But after attending the presentation of Shakthi I started my new life and decided to work in open-source Technologies and contribute to Open-source community. Now after a year and half I had the book in my hand titled “ I want to do Project tell me What to do ”. After receiving my parcel in morning I read the complete book in a day and I still found myself newbie in open-source community and enjoyed each and every guideline. Shakthi starts with most important topic Mailing list guidelines and to do's. It is very necessary for a newbie entering into Community how to communicate through various communication tools like Mailing lists,forums etc. He describes the minor things which affects on professional impression and are very important for one to follow while working in team.His guidance in “Project Guidance” really taught me an exact approach to start with open-source projects. This book encourages the students to self learn new things and make their hands dirty with programming. This is not a book to teach any language. All the programming books stop with teaching programming. But this books begins from where they stop. Students need to learn many stuff after programming. The communication with others and self discipline are the key strengths they should have. This books explains them well. I recommend this book for all the computer science students. Learning does not stops with college. If you are working and interested in contributing to Free/Open Software, this book is for you. Start with this book, follow all the tips and guidelines. You will become a rockstar contributor for your favourite Free/Open Source Software. Teachers are the big inspirations for the students. I recommend this book for all the lecturers/professors to read and contribute for any Free/Open Source software, ask their students to contribute. The quotes in each chapter are much impressive. They show the hard work behind finding them and placing in proper places. The friendly writing style makes the book, easy to read and follow. You can buy the book at the following links. Thanks Shakthi Kannan for the wonderful book.